The July 4th weekend is a great time to come to the Point Reyes area. The Point Reyes weather is generally more comfortable than the rest of the Bay Area. The food in the area is fresh as the local farms are producing their bounty. And, if you are interested, there are many local events that give you a flavor of the different towns in the area. 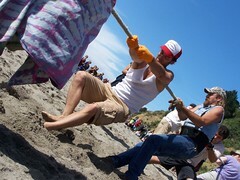 Bolinas-Stinson Beach Tug-of-War: Every Fourth of July, the towns of Stinson and Bolinas have a tug of war over the channel that separates the two towns. For more details, head over to the Point Reyes calendar.